If you love a piping hot cup of good coffee, somewhere along the way you’ve undoubtedly had the pleasure of enjoying a nibble or two of coffee cake, the centerpiece of cafes, coffee shops and home brunch tables in little towns and great cities throughout the world. 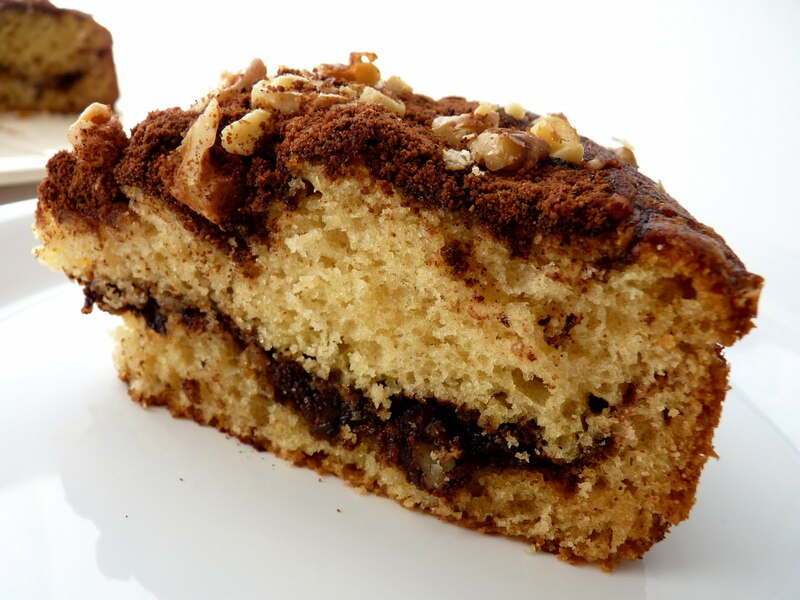 Part of the fun of coffee cake is due in part to its evolution, which has brought us many different versions from many different regions, ranging from the great yeasted cakes of Eastern Europe to the various joys of streusels and crumbs and bundts baked in America. Some are quite plain and others are bundled with fruit or nuts and spices. This version is based on a recipe from Margaret Fox, whose work was legend at Café Beaujolais in the stunning California coastal village of Mendocino. I’ve pared down the ingredients just a bit for simplicity. It’s an easy preparation and is especially fit for a special brunch or an afternoon coffee gathering. For me, this is the quintessential coffee cake. Tender and moist with a flavorful and purely delicious streusel, it’s very satisfying without being overly rich. I think you’ll have a hard time resisting a second cup, if you know what I mean. - Instant espresso powder is essential to the deliciousness of the streusel, which has a haunting blend of just the right amounts of cinnamon, cocoa and espresso powder. You can find it at Italian delicatessens, gourmet food shops and some grocery stores. Medaglia D’Oro is the best. I’ve also used Ferrara. It stores indefinitely and is used in many other pastry recipes. - When mixing cake batter, I thoroughly cream the butter and sugar until light and fluffy, but I don’t thoroughly mix the dry ingredients before adding the wet ingredients, instead stopping just short of completely mixed because as I continue to add the alternating ingredients, the batter comes together sufficiently. I also take it off the mixer just before it’s done to do the final blending of ingredients by hand with a rubber spatula. 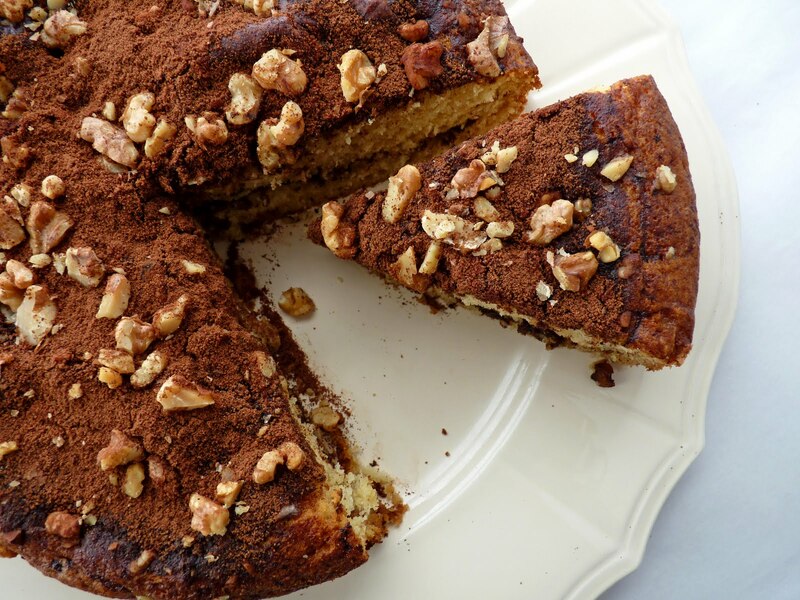 This helps to avoid overmixing and preserves the tenderness of the cake. 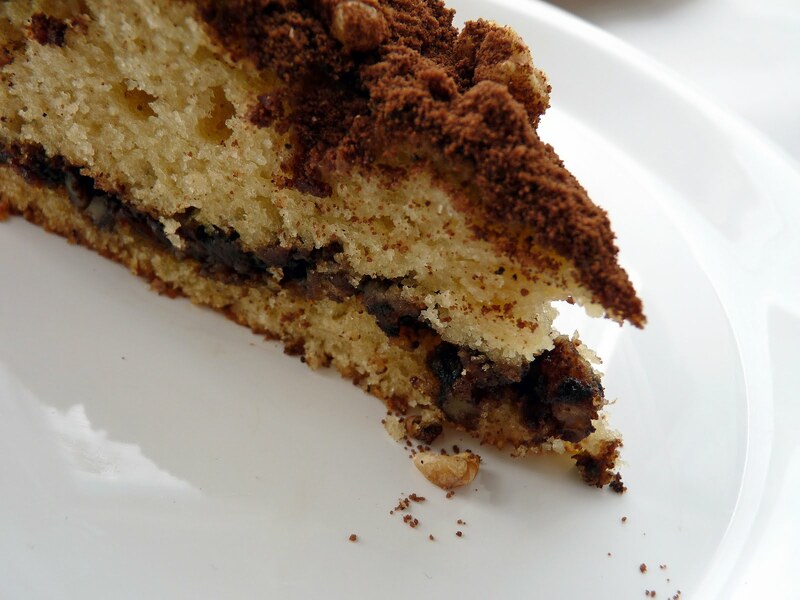 - If you like walnuts, add a few more to finish the top layer. - Café Beaujolais has another very famous Buttermilk Cinnamon Coffee Cake with a crumb topping that I’ll be testing soon. Preheat oven to 350 degrees F. Lightly grease a 9” springform pan. For the streusel, combine all the ingredients and set aside. For the cake, sift flour, baking powder, baking soda and salt. Cream butter and sugar until light and fluffy, about 3 – 4 minutes. Add vanilla and mix. Scrape down the bowl. Add egg and yolk one at a time and continue to beat until mixture is light and creamy. Lower the speed and add flour mixture in three additions, alternating with yogurt in two additions, beginning and ending with the flour mixture. Spread half the cake batter evenly in the prepared springform pan. Sprinkle with about 2/3 of streusel mixture, leaving a clean 1/2” border of cake batter around the edges. Top with remaining batter, smoothing it out to the edges. Finish with the remaining streusel, pressing gently into the surface. Bake until a toothpick inserted in the center comes out clean, about 34 – 38 minutes. Cool on a wire rack. Remove from pan and serve with a piping hot cup of strong coffee. 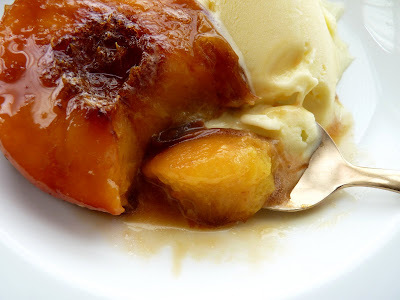 I’m really hoping you have a bounty of fresh peaches in your area because this is a fabulous dessert. It comes from Daniel Humm, a native of Switzerland who was Executive Chef at Campton Place in San Francisco and is currently at Eleven Madison Park in New York City. He's received many awards and accolades so I decided to try his take on this seasonal dessert. Wow, am I glad I did. Although this is not a particularly fancy or laborious preparation, the elements taken together feel like a well planned marriage. Fresh peaches are smothered in a light syrup of white wine, honey and a slight sprig of rosemary. Don’t let the addition of this herb scare you away; it’s only steeped for a few minutes and it deepens the flavor beautifully without overpowering or influencing too much. 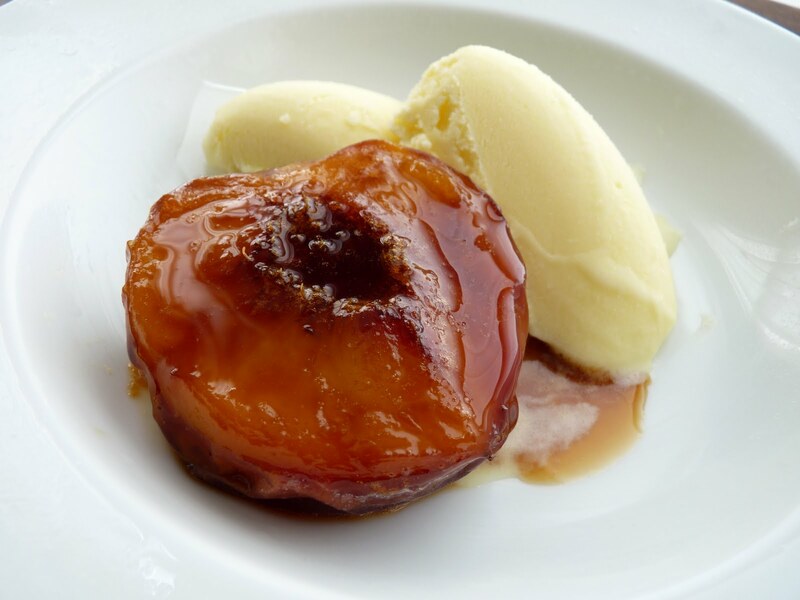 The 40 minutes of roasting really caramelizes the sauce and produces wonderfully soft fleshy fruit. The Mascarpone Ice Cream delivers a lovely and natural creamy counterpoint to the warm glow of the peaches, full of flavor without being too heavy or too rich. If you find yourself in the company of some pretty peaches anytime soon, this is an indulgence worthy of your time and attention. It’s got a bit of a Mediterranean feel to it, so it's just the sort of dessert to enjoy al fresco as a pure and simple sunny summer luxury. - The recipe calls for 7 oz of mascarpone. The container I bought was 8 oz and I wound up using the whole amount. - The Mascarpone Ice Cream as written was too sweet for my taste so I added 1/4 C buttermilk to the ice cream base. I thought this not only tempered the sweetness but also produced a wonderfully acidic tang that enhanced the mascarpone in the finished ice cream. 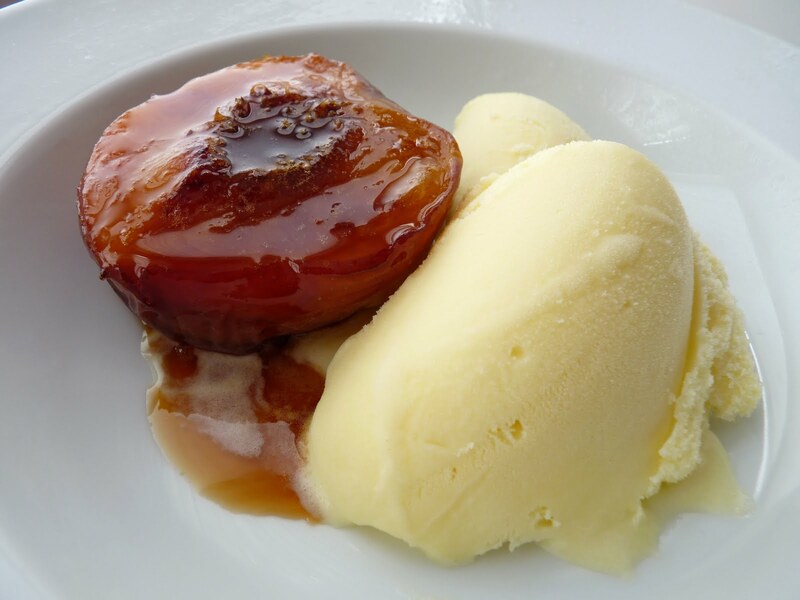 If you prefer your desserts on the not-too-sweet end of the spectrum, you can do as I did or perhaps consider reducing the sugar in the ice cream to 1/2 C + 2 T. Taste the heated milk and sugar mixture and judge accordingly. - The ice cream does take quite a bit of salt. Add a small pinch at a time and keep tasting. You'll know when it pops. - I always chill my ice cream base overnight. This give the flavors a chance to relax and marry and ensures the mixture is very well chilled, which saves on the wear and tear of your ice cream machine. - I used Viognier wine for the peaches but any good Sauvignon Blanc will do. - The recipe calls for peeling the peaches. I did not. - Put the peaches and the syrup in a baking dish that is not too large. The first time I made this in a large dish the syrup was shallow and it evaporated too quickly during the roasting process and burned. My oven does run hot, but I’d advise to check the peaches closely during that last 15 minutes of roasting. Or perhaps lower the oven temperature to 325 degrees. 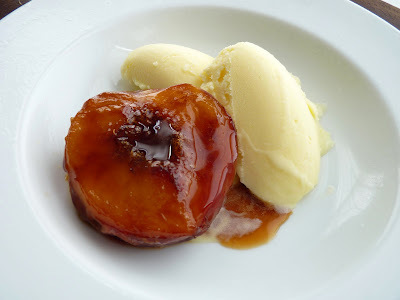 - I think this dessert is best served when the peaches and the sauce are warm. - You could definitely get more than four servings out of this if needed. - The wine sauce for the peaches is really delicious. I’m sure I’ll use it in other applications, not necessarily always for roasting. For the ice cream, combine the milk and 3/4 C sugar in a saucepan. Heat until the sugar is dissolved and the milk is simmering. Whisk the egg yolks with the 2 T sugar until light yellow. Slowly add the warm milk, whisking constantly to prevent the eggs from cooking. When all the milk has been added and combined, pour back into the saucepan and cook over medium low heat until the mixture thickens a bit, coats the back of a spoon and leaves a clean trail when you make a streak with your finger. Do not boil. Take off the heat immediately and pour into a clean container. Whisk in the mascarpone, lemon juice and salt to taste. Add buttermilk, if using. Cool completely. Cover and place in the refrigerator to chill completely. Pour the chilled custard into an ice cream maker and freeze according to the manufacturer's instructions. Transfer the ice cream to an airtight container, press a piece of plastic wrap onto the surface, cover and freeze until firm. To prepare the peaches, combine the white wine, honey, water and sugar in a saucepan and bring to a boil. Lower the heat and slow boil until the mixture is reduced by about half. Add the rosemary sprig and let stand for 10 minutes. Discard the rosemary. Peel the peaches if desired. Halve and pit them and arrange in a baking dish small enough to just fit the peach halves. Pour the rosemary syrup on top and roast the peaches until tender, about 40 minutes, basting and turning the peaches half way through. Scoop the Mascarpone Ice Cream into serving bowls and top with the peach halves. Spoon the warm poaching liquid over the fruit and serve right away. Biscotti are very traditional Italian biscuit cookies that have also found great favor in America, especially in the 90s when we saw a significant proliferation of coffee houses across the country. 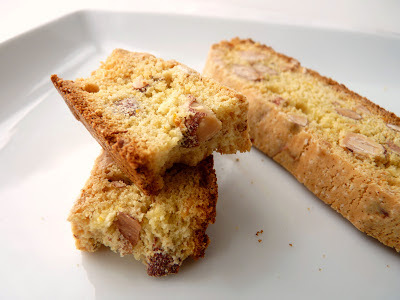 Since biscotti are very dry, crispy and crunchy in nature, in Italy they are invariably taken with a cappuccino or an espresso or Vin Santo. If you’ve ever found yourself lounging in the sun at an Italian caffè, you’ve undoubtedly dabbled in this ritual. 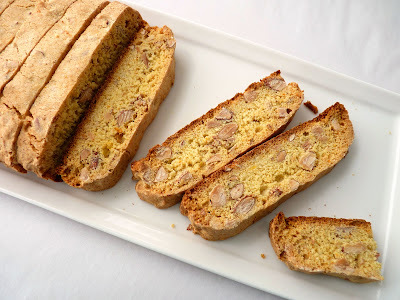 Modern biscotti originated in 13th century Tuscany and were characteristically flavored with almonds from the groves of Prato, the second largest city in the region and a leader in the slow food movement. They are made with just a few simple ingredients and baked twice to ensure extra crispness. The dough is baked in the form of a solid log and then cooled a bit to firm up. The logs are then sliced into long narrow cookie portions and toasted for about 10 minutes on each side. The result is a nice crisp biscuit full of texture and toasted almond flavor. 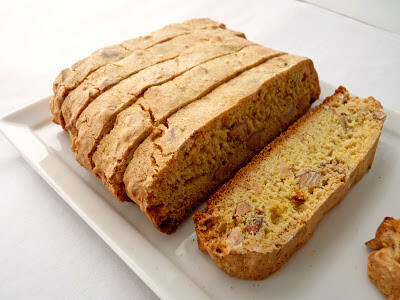 Biscotti made in this country are usually much sweeter, sometimes made with butter and full of all sorts of stuff like dried fruit and chocolate chips. These adaptations offer their own unique interest and fun but I most often favor the more traditional style. This recipe for Classic Italian Biscotti is one that was routinely baked at Chez Panisse. 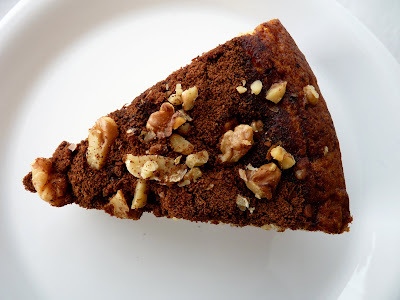 It’s full of toasted almonds and slightly flavored with orange zest and a hint of anise. Biscotti are a wonderful ritual with your afternoon sip of coffee or evening sip of wine or as an accompaniment to gelato or ice cream. They can be stored for days, the better to sneak a sumptuous bite whenever the mood strikes. - If you have strong objections to anise seeds, they can be left out but the flavor here is fairly subtle. - Beating the eggs and sugar to ribbon stage lightens the texture of the cookie so try not to over mix once the remaining ingredients are added. - Lemon zest can be substituted for orange zest. - The dough is quite wet and sticky. Lightly moisten your hands with water to make shaping the logs a bit easier. - I use a sawing motion with a sharp serrated knife to slice the baked loaves. Slice at an angle for longer and more stylish cookies. 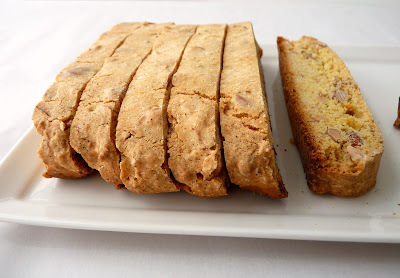 - Biscotti are best kept in an airtight container. They will last quite a long time. Preheat the oven to 350 degrees. Line baking sheets with parchment or silpat. In bowl of electric mixer, whisk eggs and egg yolk, almond extract and sugar until mixture thickens and holds its shape in a ribbon for a few seconds when the whisk attachment is lifted. Switch to a paddle and add dry ingredients, mixing on low just until the dough comes together. Add chopped almonds, anise and orange zest and blend thoroughly for about 10 to 15 seconds. Lightly moisten your hands with cold water and form the dough into two logs about 3” wide and 12” long and about 3" apart. Try not to handle the dough too much. Bake for about 25 minutes, until a light golden brown. Place the baking sheet on a wire rack. Lower oven temperature to 300 degrees. Let biscotti logs cool for 10 minutes before handling. Slice into 1/2” pieces using a sharp serrated knife. Bake for an additional 10 minutes at the lower temperature. Turn and bake for another 10 minutes or until golden brown. Cool completely on a wire rack. Store in an airtight container. I bet you remember having the old classic Lemon Pudding Cake at some point in your life. 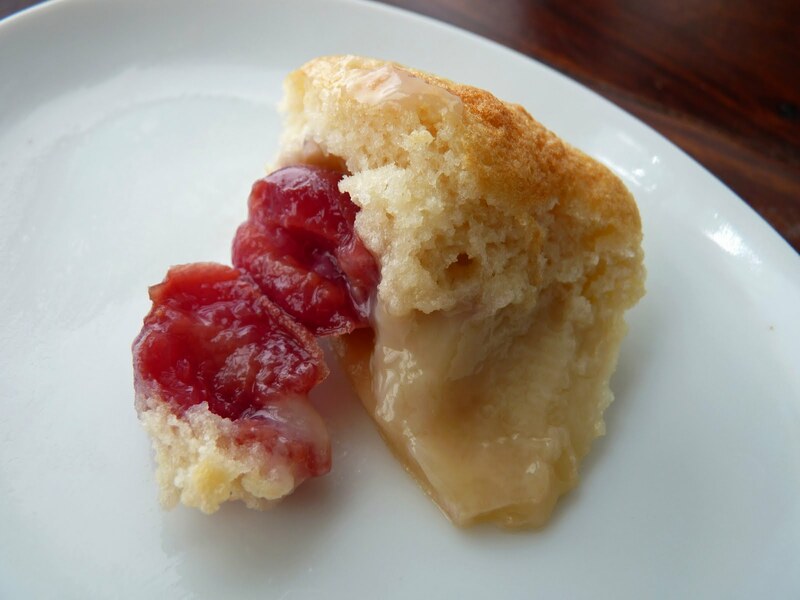 It’s a pillow of flavor and texture, the quintessential comfort dessert that was probably presented to you by your mom or grandmother way back when. I decided to resurrect it here with an added bonus of fresh cherries placed at the bottom of each cup. Part of the fun of this dessert is that it seems like a bit of a mystery to produce. There are more wet ingredients than dry and the inclusion of whipped egg whites lightens the whole mixture into a loose cloud. Although you don’t follow the conventional methods for making either a cake or pudding, as it bakes, the batter somehow transforms and separates into two distinct textures: a nice light cake at the top and a lovely soft pudding at the bottom. Magic! 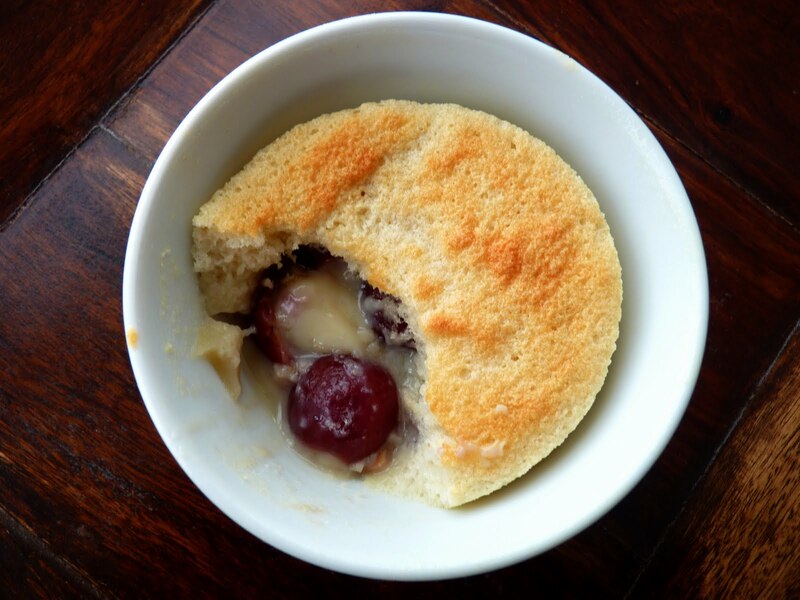 Even if you don’t have any cherries but find yourself with a few lemons, give this dessert a try anyway. It’s a simple and delicious comfort well worth the effort. - I doubled the butter to 2 oz (4 T) and I melted it to make it easier to blend with the other ingredients. - These are good either warm or at room temperature. They will probably keep for a day or so in the refrigerator but I don’t think the texture of the cake or the pudding will be the same. - Taste the cherries as they cook to determine how much sugar to add. Preheat the oven to 350 degrees. Lightly grease six 6-ounce ramekins. Place the pitted cherries in a saucepan with the water and sugar. Cook over medium low heat for about 10 minutes or until the fruit is softened. Set aside to cool. Distribute them equally among the six ramekins. Whisk all but 2 tablespoons of the sugar with the flour. In another bowl, whisk together the milk, lemon juice, lemon zest and egg yolks. Whisk in the melted butter until well blended. Combine the lemon mixture with the sugar and flour mixture and whisk until smooth. The mixture will be very thin and may look curdled. Beat the egg whites with the remaining 2 tablespoons of sugar and the salt until stiff peaks form. Gently fold the egg whites into the lemon mixture one-third at a time. 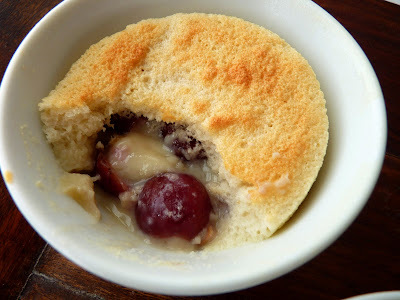 Pour the batter into the prepared ramekins and place them in a small roasting pan. Place the pan in the oven and pour in enough hot water to reach halfway up the sides of the ramekins. Bake the pudding cakes for about 25 minutes or until they are puffy, firm to the touch and golden on top. Use tongs to carefully transfer the ramekins to a rack to cool. Serve warm or at room temperature.